Dining halls：There are two dining halls on campus, namely Jingfeng and Fengting. You can enjoy delicious food of different flavors as well as halal food in Jingfeng cafeteria by using e-card. Different flavors of food of favored prices， please click for the sample MENU. Auto-vending machines：Auto-vending machines can be found in the college building selling beverages and snacks. Supermarket: There is a store selling all kinds of beverages and snacks as well as things for daily necessitie. Snack bars: The third floor of Jingfeng cafeteria sells special food of different flavors in China including local Fujian food like Ginger Duck, Noodles with Satay Sauce, Braised Noodle and Soy Meat of Putian, Thread Paste and Glutinous Rice Dumpling of Quanzhou, Flat Dumpling Soup and Soy Source Noodles of Shaxian. Typical flavors of other provinces can also be found there. For example, Long Chao Shou and Spicy Tan Tan Noodle from Chongqing, Pita Bread Soaked in Mutton Soup and Minced Beef Noodles from Xi’an, Steamed Rice Rolls and Hot Pot Porridge from Chaoshan, etc. Besides, to meet various tastes of international students, snack bars also provide Western snacks like Hamburger, Fried Chicken, Chip, Ham-sandwich as well as other exotic food like Indian Chapati. Coffee houses：Coffee is already an important part of XMU campus culture. There are over 10 coffee houses in Siming campus including famous ones like Lake café and 1921 Coffee College. New cafes are opening now and then on Xiang’an campus which was put in use just Sept. of 2012. Among them, Impression XMU Coffee located in second floor of Jingfeng cafeteria offers not just coffee, but tea and snacks, as well as biscuits, sandwiches and special desserts. The coffee house alos has a very good view over Xiang’an campus, especially the area near the lakes. Besides, almost every college on Xiang’an campus owns a coffee house, which plays an important role as a platform for student recreation and exchanging ideas. The OEC coffee house is located in the first floor of the college building. Student shopping street（学生街）：Student shopping street of Xiang’an campus is located in front of the east gate, covering an area of over 20,000 square meters and consisting of a commercial street, complexes, hotels and apartments. Now there are mainly shops for catering, retail, clothes, beauty salon, banking and communication, such as CNHLS Fast Food, YES Convenience Store, Luda Optical, Laosai Coffee and Aiyaya Boutique. 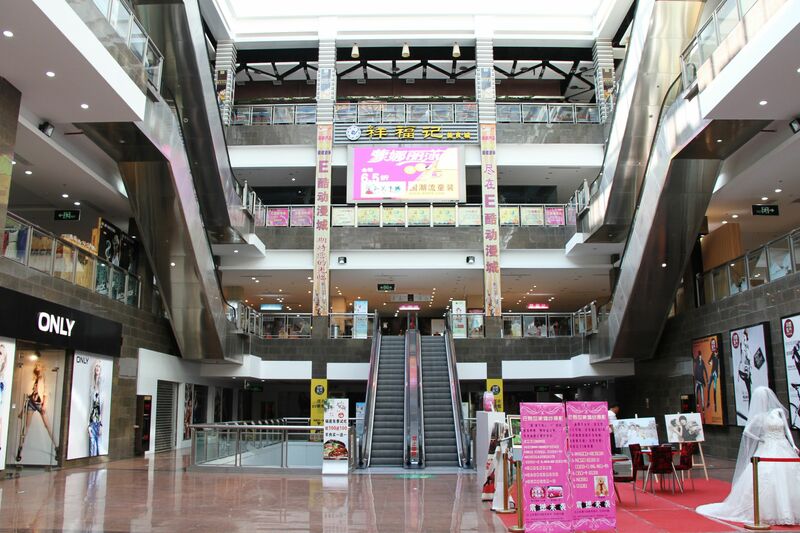 Huijing Shopping Mall（汇景购物广场）： Huijing Shopping Mall is the largest commercial complex in Xiamen outside the island and the first one-stop shopping center. Famous merchants like Renrenle Supermarket, Zhongying Cinema Complex (five-star) , Suning Appliance, Pizza Hut, KFC, Watsons and Formosa-optical already have a presence there. Bus No. 761 for partial routine can take you from Xiang’an campus to Huijing center within 15 minutes. Maxiang old street（马巷街）: It is a busy narrow street 2000 meters long and 7 meters wide. A Christian church （同美基督教堂） is located at one head, temples for Chiwangye（池王宫/元威殿） and Goddess of Mercy（观音庙） in the middle, and Chenghuang temple（城隍庙） nearby. Hundreds shops and stalls sell special food, clothes, daily things, and many other stuffs. Religion, shopping and local food are well combined within one street. Therefore, it is always crowded day and night with people from different places with varied needs. The temple for Chiwangye was built in Ming dynasty and Chenghuang temple in Qing dynasty, both listed as Xiamen culture relics related to Taiwan in 2001. Maxiang town has a long history of more than 1000 years and is the home to over 100,000 overseas Chinese in Taiwan, Hongkong, Macao and many other places in the world. Bus No. 707 can take you there from Xiang’an campus in about half an hour. Being the heartland of Xiamen’s commercial area, Zhongshan Road Pedestrian Street covers a total area of one million square meters and takes up nearly one third of the total business area of Xiamen. This is a beautiful and prosperous commercial corridor where you can find the serried ranks rows of stores with a dense crowd. The Zhongshan Road Pedestrian Street was founded in 1925. The name of the street was changed to “Da han Road” during the Puppet Governed by Japan. The Zhongshan Pedestrian Street was changed into “DongfanghongRoad” in 1966 and back to Xiamen Zhongshan Road in October of year 1979. Zhongshan Road Pedestrian Street became a prosperous Commercial Street since 1959. In 2004, the west section of Zhongshan Road was designated as the pedestrian area where motor vehicles were banned. Since then, the pedestrian flow has greatly increased. In 2005, the number of passing-by people in Zhongshan Road was up to 1.1 billion a year. The Zhongshan Road Pedestrian Street is 1198 meters long and 15 meters wide. Most of the buildings along the street were constructed by the returned overseas Chinese in 1920s. Influenced by the architecture style of Western Sea area, most of the buildings have the type of British except a few with France and German flavor. When you are walking around the street, you can not only feel the intense competition of the market economy, but also can taste the fresh aroma of the socialistic civilization. The Qilou Street of Zhongshan Road is the representative of architecture culture of Xiamen City. “Qilou （骑楼） Street” means the street is under buildings. This kind of architecture which takes pink and ivory-white as the main hue has a strong exotic flavor of South Seas area. Strolling in Zhongshan Road, you can feel the vitality and the vigor which were exploded by competitions and all merchants are trying their best to fit the intense competition. All the merchants around the street have promoted a series of service projects aiming for keeping business rules, good mannered and offering the conveniences and advantages to citizens. Many shops and stores are awarded as good-mannered units or trusted enterprises at the district, municipal or provincial levels. The activities of being a “Good Street” and “Non Fakes Shop” promote a good environment for trading and business to the Zhongshan Road Pedestrian Street. You can take Bus No. 751 or weekend student bus to the terminal and change to No. 1/21/15/45. Xiamen Huli Wanda Plaza is sparing no efforts to offer ever better, unique services and become a community center to survive in the Internet era. Completed in 2011, Xiamen Huli Wanda Plaza has increased the number of restaurants and beverage outlets to persuade shoppers to stay longer, and offers promotions to reward frequent shoppers who can be tracked via their mobile phones. With the opening of Huli Wanda International Cinema, which is the first IMAX cinema in Xiamen, and the 29th in China, the shopping mall has now become a new stylish icon in the city. In addition to this, Hili Wanda Plaza also borrowed ideas from developing markets where centers are part of wider mixed-use developments where people live or include opens spaces where they spend leisure time. Students at Xiang'an campus of Xiamen University can take Bus No. 751, change to Bus No. 656/754/653/780/758/757 at Linqian station （林前站） and get off Wandaxi station (万达西站). World Trade Mall is a public place of shopping, leisure and entertainment which enjoys a great reputation in Xiamen. It is near the railway station in the city center, which offers a convenient transportation. Except for the world-known Wal-Mart, Paris Spring and McDonald, KFC entering the Mall, the cola food plaza on the 5th floor also worth mentioning, in which all kinds of Xiamen traditional famous snacks, Chinese food and exotic taste gathered together. In the Mall, you can enjoy a great time in a warm and fragrant environment. 1. take Bus No. 761, change to Bus No. 753 at Xindian station（新店站） and get off at the terminal. 2. take Bus No. 761, change to Bus No. 750 at Huoju Lukou station（火炬路口站） and get off at the terminal.